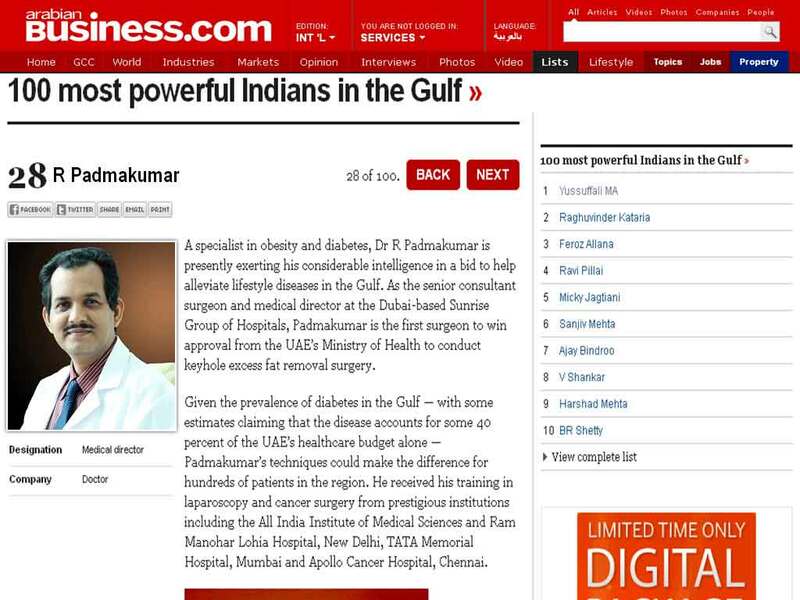 A specialist in obesity and diabetes, Dr. R. Padmakumar is presently exerting his considerable intelligence in a bid to help alleviate lifestyle diseases in the Gulf. Dr. Padmakumar is the first surgeon to win approval from the UAE's Ministry of Health to conduct keyhole excess fat removal surgery. Given the prevalence of diabetes in the Gulf - with some estimates claiming that the disease accounts for some 40 percent of the UAE's healthcare budget alone - Dr. Padmakumar's techniques could make the difference for hundreds of patients in the region. He received his training in laparoscopy and cancer surgery from prestigious institutions including the All India Institute of Medical Sciences and Ram Manohar Lohia Hospital, New Delhi, TATA Memorial Hospital, Mumbai and Apollo Cancer Hospital , Chennai.